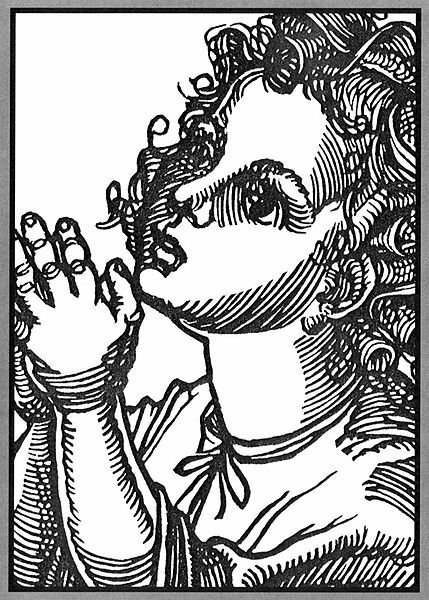 I never made a habit of reciting that child’s prayer before falling asleep at night when I was a kid — or as an adult, either. I’ve always assumed that I would awaken each morning. I’ve always trusted in the nature of the sleep-and-awake cycle. After all, it is common to all living things that walk the earth. Some believe — i.e. Theosophists like me — the universe has its days and nights, too. The cycles we experience are simply microcosmic reproductions of the cycles of a living Universe, of which we are manifestations. Of that I have no doubt. I know it in my heart. So, it seems to me, each night we die and each morning we are reborn — as in, “today is the first day of the rest of your life.” Death and rebirth is a nightly/daily theme throughout our lives, to the point that we don’t give it a second thought very often. We trust in the nature of things. We trust that we will wake up in the morning. So why then do so many people fear The Big Sleep — death? Why do so many think we will not awaken after we leave our mortal coils? Of course, there are some who think life is a dream — and the snow currently falling outside my window is an illusion. If life is just a fantasy, do I really need to shovel the snow from my walkway tomorrow morning? 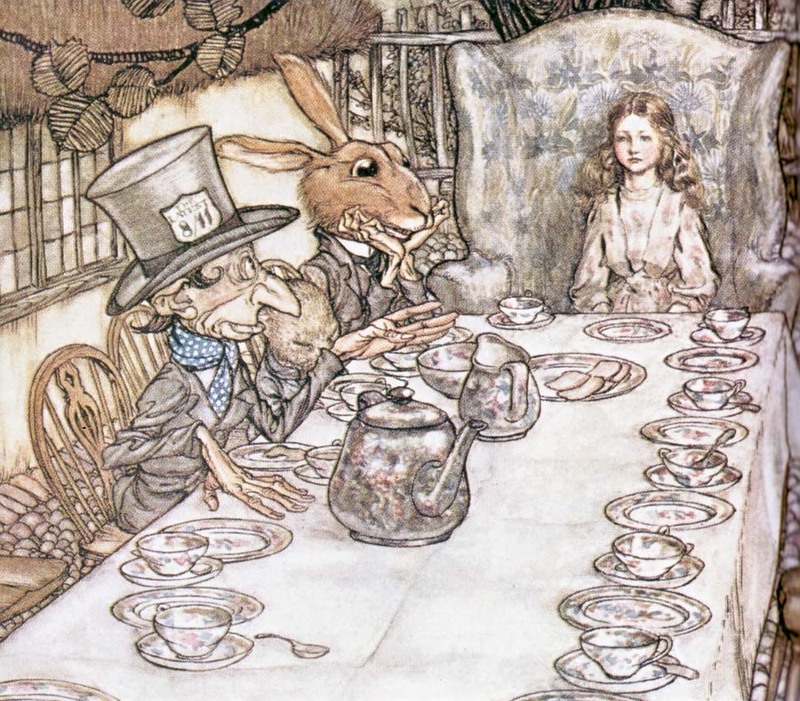 Indeed, I think Lewis Carroll nailed it with Alice in Wonderland, and that death simply leads to another journey down — or is it up? — a rabbit hole . . .
“In my Father’s house are many mansions,” Jesus is reported to have said. Many wonderlands, no doubt. Many dimensions . . . I trust that when I fall asleep for the last time in my current body, I will eventually awaken and land on my feet somewhere. The question is: How many feet will I have, and where will I be? P.S. As I sat here wondering what I might use as a title for this post, the song Gimme Shelter started playing on the radio. À propos? Next Next post: Nudism/Naturism: Bathroom issues? Death really is the “final frontier”, and is the only “inevitable” we face in life. There are people who have had “near-death” experiences and lived to tell about it. There are even a few people who claim that they died and have come back to life, and some of them have written about their experiences. One man described a terrifying descent into a roaring inferno before he was sent back to the land of the living. Others have described rising in a peaceful tunnel of light to a beautiful place before being sent back to the land of the living. When my brother died in July, 2011, family members said that he had a peaceful, serene countenance when he took his last breath. A lady who died in the hospice house that my dad was in for a while was described as anything but peaceful when she died. She screamed and clung to the sheets when she was taking her last breaths. What is on the other side of that worm-hole of death? We won’t really know until it is our turn to pass through it. I do believe that what we do in this life does have an affect on what kind of after-life we will have. Thank you, pipermac. In my Theosophical/occult studies, I have read that we see what we expect to see after we leave our mortal coils. So, if you expect to see streets paved with gold, you will see that. But it is illusion — Heaven is illusion — and after a time, it fades away. The Tibetan Book of the Dead is devoted to the afterlife journey, and talks about the various illusions one might see as the astral body and the mental body break down — for, apparently, we are composed of several bodies, and each goes through a disintegration process in a state of “purgatory.” The important thing to remember is that everything you see or seem to encounter comes from within you in perhaps a phantasmagorical fashion. 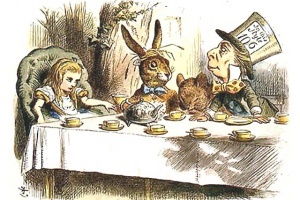 We are all Alice in wonderland, through this life and all the various states to come. The world is a stage . . . Many believe that we will ultimately unite with the universal One from whence we came, in a state of nirvana or bliss, perhaps when this long day of the universe succumbs to its night of rest. But one thing is for sure: we can all trust in the nature of things, and death is nothing to fear — whether it is a doorway to something else or instant nirvana. I might also add that occultists believe one goes through a period after death when you see how your actions in life affected other — more than see, but intensely feel the sorrow or happiness, whatever the case may be. A person like Hitler would probably still be in a state of purgatory, feeling the intense pain he caused so many people. It’s no wonder some refer to purgatory as hell. But ultimately, all souls are delivered from that state and move on. Most important of all: it is believed that karma prevails, that you reap what you have sown. So, if you murdered someone in a past life, you will probably be murdered in a future life. It’s not punishment: it’s Gardening 101. Hitler, then, may very well die 6 million or more terrifying deaths in this one day of the universe, or in the new days to come. Of course we will be reborn in the sense that in this universe matter is neither created or destroyed only reformed. Our spirit is parcelled out to those around us. So we truly never die and quantum physics teaches us we are after all simply indestructible units of energy. However, our self awareness is also reformed so we will never know a future or a past life. Hmm. The first part of your comment gave me great hope, the latter part dashed the hope. However, I have read in occult and Theosophical literature that in between lives, one loses all sense of time and sees the past, present and future as one — and can “see” all of one’s incarnations.